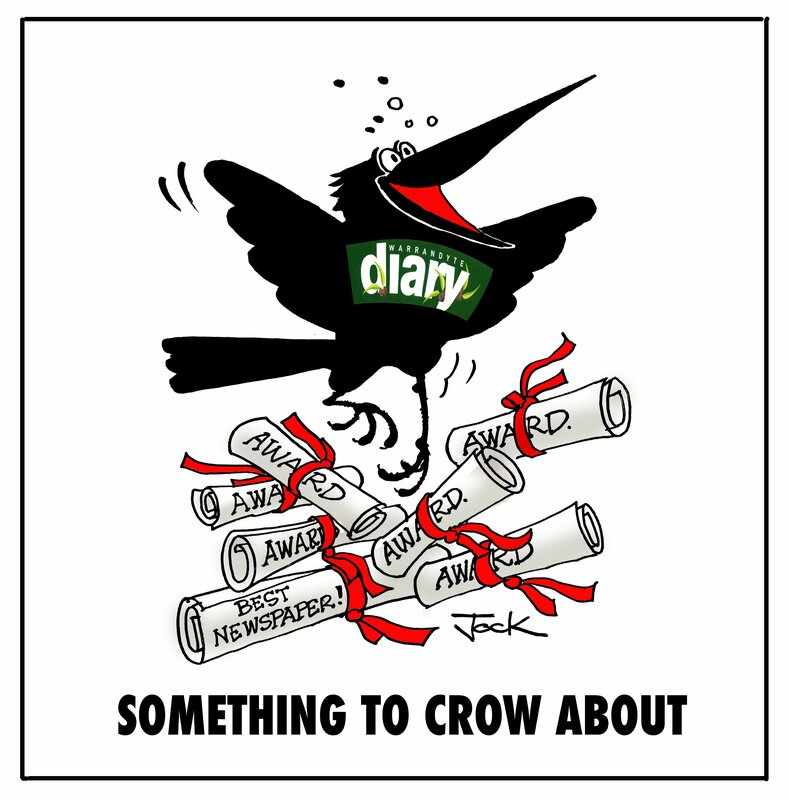 Diary is ‘Best Newspaper’ again! For the third successive year the Warrandyte Diary has claimed the title as Best Newspaper at the Community Newspaper Association of Victoria (CNAV) annual awards. Diary stalwart Jock Macneish and his wife Di attended the awards and almost wore out their shoes in walking up to collect them on behalf of the Diary. We managed to win four of the nine awards, including Best Newspaper (2014-15-16), Best Sports Reporting, Best Feature Story (Sammi Taylor’s investigation of Lyme Disease) and Best Photograph (Bill Hudson-McAuley’s wonderful photograph taken at Ron Day’s funeral). We also finished as finalists in another three including Best Editorial Comment (editor Scott Podmore’s close look at social media in the local community), Best Design and Layout, and Best History Story (Living in the ’50s). This entry wins because of its all-round appeal, combining excellent hard news with great photographs, an engaging front page, features and coverage of grass-roots events. Particularly notable was its strong hard news coverage on issues where accurate, current information for residents was paramount: including stories on a VicRoads bridge proposal, a plan to extend the M80 Ring Road and a VCAT hearing on a proposed new petrol station. These stories were well-crafted, relevant and strong, admirably answering the five golden questions of journalism: who, what, where, when and why. Clearly the stories were also being chased and followed up, demonstrating a drive to actively hunt for the news and report it, not just re-print a press release. This entry also stood out for an excellent feature on socal media and a comment piece adding context to a controversial planning amendment. The ‘Our Living Treasure’ column is a wonderful idea, in this edition profiling a local potter, a piece that illuminated the region’s rural past with lyrical humour. A top-notch sports section completed the picture. With minor quibbles, page designs were good: photos were used well, and headlines and sub-headings were appropriate and well-written. All stories were well-crafted and edited with care. A great example of a community newspaper with both heart and teeth. The name ‘diary’ and the masthead are a lovely feel for a community newsletter, obviously including as many local people as possible. This newsletter is packed full of great articles which are easy to find and read. It resembles a newspaper which would encourage readers to have a look. The front cover is engaging with its big type drawing the reader in. I think the community would keep this newsletter and come back and back to read more. Care and concern for a serious local issue, well researched, well written, balanced. A detailed, comprehensive, serious look at an important issue. Well done! The winning entry stood out for a number of reasons. The front page photograph is a cracker and I loved the headline and the use of colour in the headline. The short sharp introduction draws readers into the extensive finals coverage inside. The Warrandyte Diary’s spread on the grand final Triple Treat inside is a great read and the pictures and layouts are clean and first rate. I also loved the double page spread of celebratory pics combined with the top 10 highlights of the match. This was a really innovative idea. The coverage indicates the writers and photographers spent considerable time and effort covering the matches and its fantastic they got reactions and responses from the people involved. It’s all about our local people and community after all. The Warrandyte Diary has also devoted loads of space to a wide array of other sports and local achievers. This is a snapshot of a town at a particular time – Warrandyte in the 1950s. Bill describes the town and the shops and the home delivery men – the baker, the milkman, the iceman and the dunny man (who collected not delivered!) and just the simple pleasures of growing up in a country town where children were encouraged to make their own entertainment. Lovely story. The winner was clear cut. This was an extremely well written piece of investigative journalism. It was sensitively handled, beautifully structured and whole article was a gripping read from the first word to the last. This very important story is about Lyme disease not being acknowledged as a medical condition in Australia and details the pain and anguish being experienced by several Warrandyte residents with Lyme-like symptoms. Excellent work Sammi. This is a very moving photo taken under challenging circumstances. In covering a funeral the photographer has to strike a balance between being respectful and being present, perhaps even intrusive, enough to tell the story. Shot from a discrete position that demonstrates respect for the grieving family, tightly framed to remove unnecessary detail, and carefully timed to capture Kianie’s hand in a final farewell to her grandad, this is a quiet and very touching image.